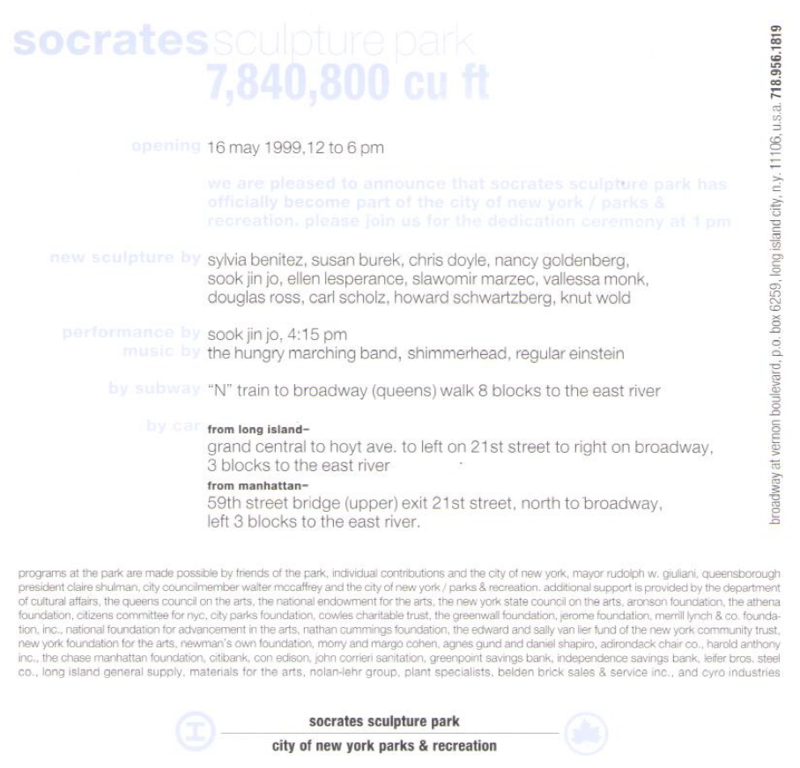 We are pleased to announce that Socrates Sculpture Park has officially become part of the City of New York/Parks & Recreation. Please join us for the dedication ceremony at 1pm. Opening performance- Performance by: Sook Jin Jo, 4:15pm. Music by: The Hungry Marching Band, Shimmerhead, and Regular Einstein. 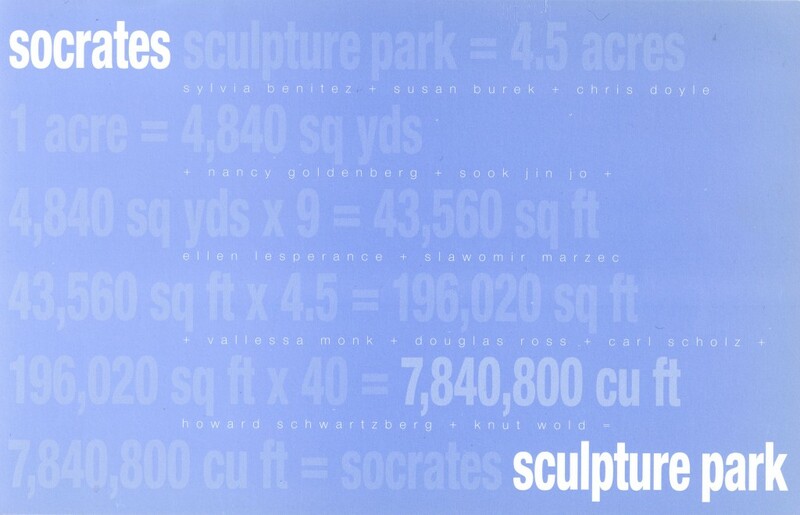 Programs at Socrates Sculpture Park are made possible by friends of the park, individual contributions and the City of New York, Mayor Rudolph W. Giuliani, Queensborough President Claire Shulman, City Councilmember Walter McCaffrey and the Department of Parks & Recreation. Additional support is provided by, the Department of Cultural Affairs, the Queens Council on the Arts, the National Endowment for the Arts, the New York State Council on the Arts, Aronson Foundation, the Athena Foundation, Citizens Committee for NYC, City Parks Foundation, Cowles Charitable Trust, the Greenwall Foundation, Jerome Foundation, Merrill Lynch & Co. Foundation, Inc., National Foundation for the Advancement in the Arts, Nathan Cummings Foundation, the Edward and Sally Van Lier Fund of New York Community Trust, New York Foundation for the Arts, Newman’s Own Foundation, Morry and Margo Cohen, Agnes Gund and Daniel Shapiro, Adirondack Chair Co., Harold Anthony Inc., the Chase Manhattan Foundation, Citibank, con Edison, John Corrieri Sanitation, Greenpoint Savings Bank, Independence Savings Bank, Leifer Bros. Steel Co., Long Island General Supply, Materials for the Arts, Nolan-Lehr Group, Plant Specialists, Belden Brick Sales & Service Inc., and Cyro Industries.